Spanish sweet paprika is made from ground red pepper has a rich red colour while retaining a mild flavour which complements most savoury dishes. Due to its vibrant colour and full bodied flavour it is used in many European and Indian dishes. 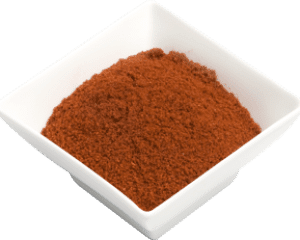 Spanish paprika sweet is made from ground red pepper has a rich red colour while retaining a mild flavour which complements most savoury dishes. Due to its vibrant colour and full bodied flavour it is used in many European and Indian dishes. It gives a subtle caramelised sweet warmth to dishes and it is a core ingredient in our North Africa Chermula. Labelled one of the most versatile and most used spices in the world. Paprika is used as an ingredient in numerous dishes throughout the world. It is principally used to season and color rices, stews, and soups, such as goulash, and in the preparation of sausages, mixed with meats and other spices. In the United States, paprika is frequently sprinkled raw on foods as a garnish, but the flavour is more pronounced when heated. To enhance its flavour, it should be heated in oil prior to use. Add to home made lamb burgers, sausages, chickpea tagine, and paella. Use in your sauces, spice rubs, braises and as a seasoning. Use it as a garnish for cream sauces and egg dishes. Use to season and color rices, stews and soups as goulash. Mix with other spices and for preparing sausages.